The workgroup option in the global section should match the netbios name of the Active Directory domain. Authentication will not be handled by samba now, but by the Active Directory domain controllers, so we set the security option to domain. Linux requires a user account for every user accessing its file system, we need to provide Samba with a range of uid's and gid's that it can use to create these user accounts. The range is determined with the idmap uid and the idmap gid parameters. The first Active Directory user to connect will receive Linux uid 20000. The winbind use default domain parameter makes sure winbind also operates on users without a domain component in their name. Below is our new global section in smb.conf. To connect to a Windows 2003 sp2 (or later) you will need to adjust the kerberos realm in /etc/krb5.conf and set both lookup statements to true. Nothing special is required for the share section in smb.conf. Remember that we do not manually create users in smbpasswd or on the Linux (/etc/passwd). Only Active Directory users are allowed access. While the Samba server is stopped, you can use net rpc join to join the Active Directory domain. We can verify in the aduc (Active Directory Users and Computers) that a computer account is created for this samba server. The winbind daemon is talking with the Active Directory domain. We need to update the /etc/nsswitch.conf file now, so user group and host names can be resolved against the winbind daemon. Time to start Samba followed by winbindd. You can use wbinfo -t to verify the trust between your samba server and Active Directory. We can obtain a list of all user with the wbinfo -u command. The domain is not shown when the winbind use default domain parameter is set. We can obtain a list of all domain groups with the wbinfo -g command. The domain is not shown when the winbind use default domain parameter is set. We can use wbinfo -a to verify authentication of a user against Active Directory. Assuming a user account harry with password stargate is just created on the Active Directory, we get the following screenshot. We can use getent to verify that winbindd is working and actually adding the Active directory users to /etc/passwd. 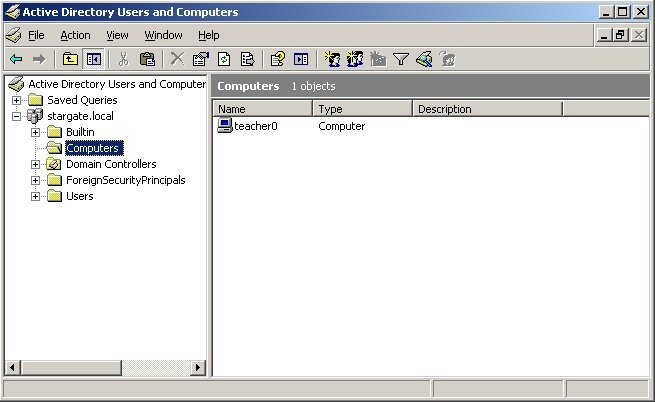 If the user already exists locally, then the local user account is shown. This is because winbind is configured in /etc/nsswitch.conf after files. All the Active Directory users can now easily connect to the Samba share. Files created by them, belong to them. 1. Verify that you have a working Active Directory (AD) domain. 2. Add the domain name and domain controller to /etc/hosts. Set the AD-DNS in /etc/resolv.conf. 3. Setup Samba as a member server in the domain. 4. Verify the creation of a computer account in AD for your Samba server. 5. Verify the automatic creation of AD users in /etc/passwd with wbinfo and getent. 6. Connect to Samba shares with AD users, and verify ownership of their files.